CPU: Custom, discrete-logic microcoded with 48-bit instruction word, 16k microcode store. Z80 I/O coprocessor. 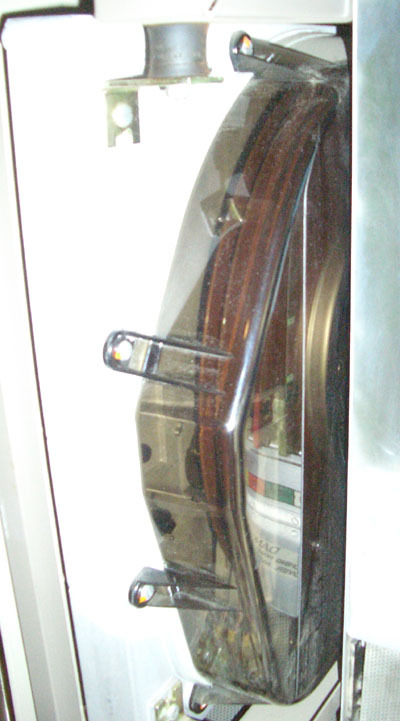 Storage: 14" Shugart SA4002 winchester disk, 24mb capacity. 8" Shugart Floppy drive. This is quite possibly the most interesting (and rare) machine in my collection. It is significant as an interesting historical note, as well as being a very interesting piece of hardware. 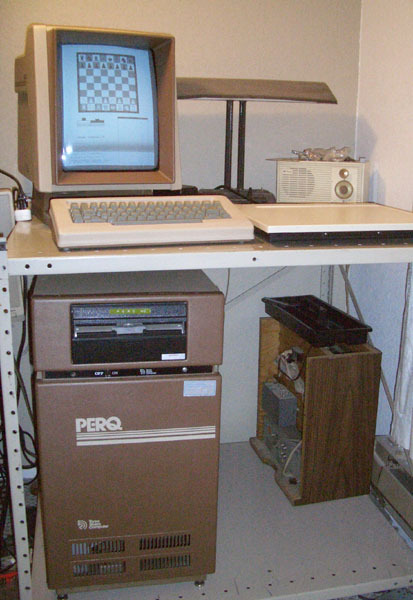 The PERQ is arguably the first commerically available workstation with a bitmapped display and was in many ways far ahead of its time. Unfortunately, like so many computers lost to the ages the PERQ never really found a market due to poor management and has since faded into obscurity. A decent general overview of the PERQ and its history is available on Wikipedia. 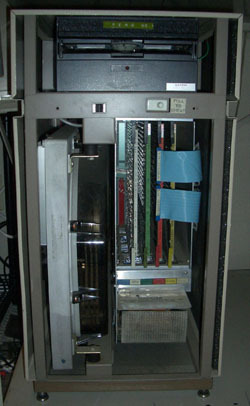 The PERQ pictured above is a PERQ 1A, serial number 259, running both POS D.6 and Accent S4. POS is a fairly simple, single-tasking operating system and was probably the most widely-used OS for the PERQ over the course of its lifespan. Accent is a multitasking, windowed environment and was developed on PERQs at Carnegie-Mellon University. 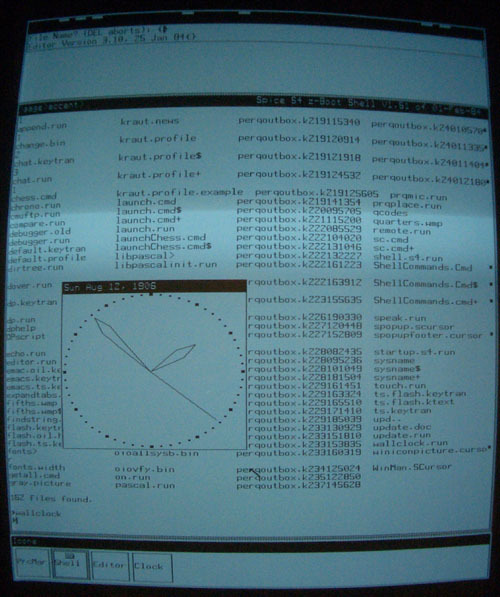 The Accent kernel is a direct ancestor of the Mach kernel, which was later used by NeXTSTEP and eventually Mac OS X. PERQs were also known to run a number of UNIX dialects. The system features an incredibly crisp bitmapped portrait display, and uses a digitizer tablet and puck (a GPIB variant of the Summagraphics BitPadOne) as a mouse. My PERQ came with a home-made digitizer puck which works very erratically, I hope to replace it with a more authentic (and reliable) puck at some point in the future. I know very little of this history of this particular PERQ. Based on the asset tag on the front it was used at Siemens in their telecommunications engineering division. I don't know specificially what it was used for in that department. 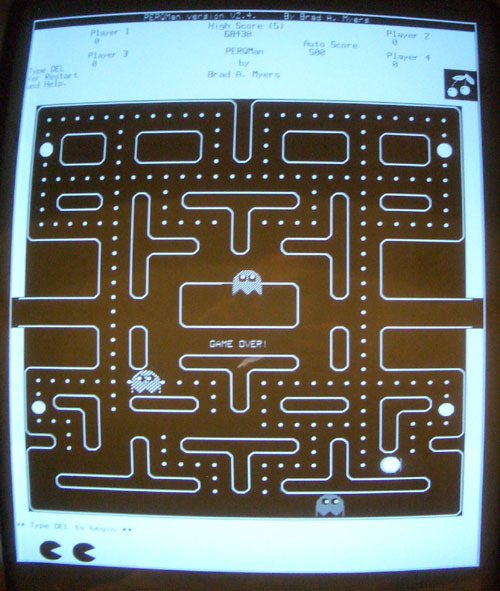 I am currently hard at work on an emulator for this system, so that others might bask in the glory of the PERQ. The going is quite slow, but I am making progress on getting POS to boot. You can find out about that project (and other related utilities) here. This is the PERQ with the front cover removed. On the top is the 8" Shugart floppy drive. 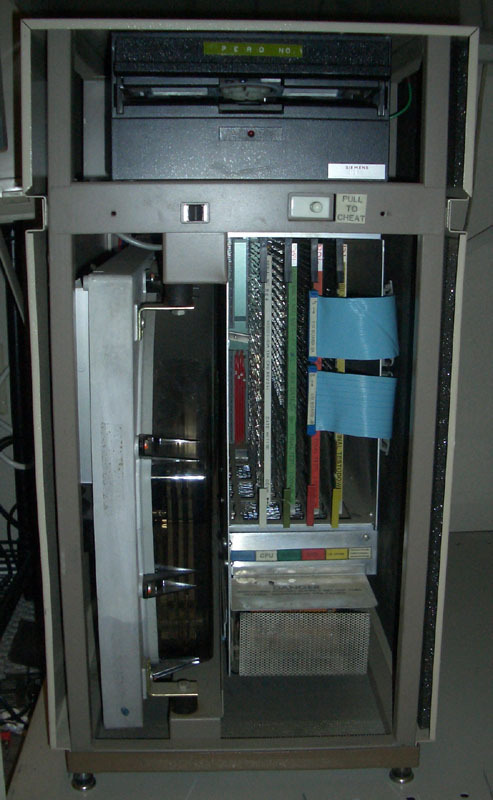 On the bottom left, mounted vertically is the gigantic 14" Shugart 4002 hard disk, capable of storing a massive 24mb worth of data. (I have dumped an image of this disk, which you can find here if you so desire). To the right of that is the cardcage, which contains all of the magical computing hardware that makes the PERQ do its thing. These are color-coded to prevent the wrong card from going in the wrong slot. From left to right, the cards are: 16K CPU, 1MB memory, IOB, and OIO. Below the cardcage is the PERQ's power supply. Here's a closeup of the hard disk. It has a translucent cover (which I'm incapable of taking a good picture of...) so you can watch the gigantic platters spin and the heads move while the machine is running -- pretty neat, if I do say so myself. Here's a nice blurry photo of POS D.6 immediately after a successful boot. Evidently someone at Siemens was a Zippy the Pinhead fan, based on the "YOW! Are we computing yet?" MOTD. I can dig it. The PERQ running Chess. 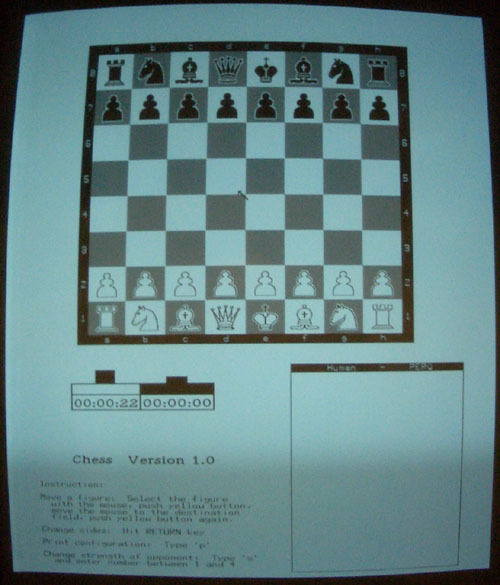 The digitizer puck is used to select and move pieces -- note the mouse pointer in the center of the chess board. Screenshot of Accent S4 running. 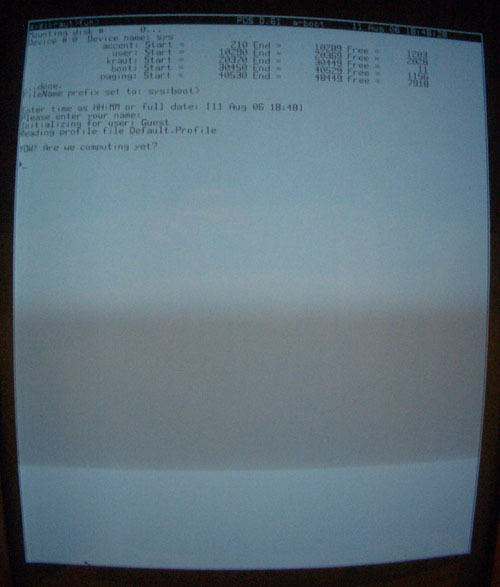 "wallclock" is running in the foreground (looks quite similar to xclock from X11...). Note the lack of Y2K-compliantness. The row of icons at the bottom of the screen indicates what tasks are currently running, and allows the user to switch between them using the mouse. bitsavers.org has a pretty good collection of PERQ-related software and documentation. And of course, the always-useful PERQ FAQ, by R. D. Davis.